Rosacea is a skin disease typically appearing in people during their 30s and 40s. It is marked by redness (erythema) of the face, flushing of the skin, and the presence of hard pimples (papules) or pus-filled pimples (pustules), and small visible spider-like veins called telangiectasias. In later stages of the disease, the face may swell and the nose may take on a bulb-like appearance called rhinophyma. Rosacea produces redness and flushing of the skin, as well as pustules and papules. Areas of the face, including the nose, cheeks, forehead, and chin, are the primary sites, but some people experience symptoms on their necks, backs, scalp, arms, and legs. The similarity in appearance of rosacea to acne led people in the past to erroneously call the disease acne rosacea or adult acne. Like acne, the skin can have pimples and papules. Unlike acne, however, people with rosacea do not have blackheads. In early stages of rosacea, people typically experience repeated episodes of flushing. Later, areas of the face are persistently red, telangiectasia appear on the nose and cheeks, as well as inflamed papules and pustules. Over time, the skin may take on a roughened, orange peel texture. Very late in the disorder, a small group of patients with rosacea will develop rhinophyma, which can give the nose a bulb-like look. Up to one half of patients with rosacea may experience symptoms related to their eyes. Ocular rosacea, as it is called, frequently precedes the other manifestations on the skin. Most of these eye symptoms do not threaten sight, however. Telangiectasia may appear around the borders of the eyelid, the eyelids may be chronically inflamed, and small lumps called chalazions may develop. The cornea of the eye, the transparent covering over the lens, can also be affected, and in some cases vision will be affected. There is no known specific cause of rosacea. A history of redness and flushing precedes the disease in most patients. The consensus among many experts is that multiple factors may lead to an overreaction of the facial blood vessels, which triggers flushing. Over time, persistent episodes of redness and flushing leave the face continually inflamed. Pimples and blood-vessel changes follow. Certain genetic factors may also come into play, although these have not been fully described. The disease is more common in women and light-skinned, fair-haired people. It may be more common in people of Celtic background, although this is an area of disagreement among experts. Certain antibiotics are useful in the treatment of rosacea, leading some researchers to suspect a bacterium or other infectious agent may be the cause. One of the newest suspects is a bacterium called Helicobacter pylori, which has been implicated in causing many cases of stomach ulcers but the evidence here is mixed. Other investigators have observed that a particular parasite, the mite Demodex folliculorum, can be found in areas of the skin affected by rosacea. The mite can also be detected, however, in the skin of people who do not have the disease. It is likely that the mite does not cause rosacea, but merely aggravates it. Diagnosis of rosacea is made by the presence of clinical symptoms. There is no specific test for the disease. Episodes of persistent flushing, redness (erythema) of the nose, cheeks, chin, and forehead, accompanied by pustules and papules are hallmarks of the disease. A dermatologist will attempt to rule out a number of other diseases that have similar symptoms. Acne vulgaris is perhaps the disorder most commonly mistaken for rosacea, but redness and spider-like veins are not observed in patients with acne. Blackheads and cysts, however, are seen in acne patients, but not in those with rosacea. Other diseases that produce some of the same symptoms as rosacea include perioral dermatitis and systemic lupus erythematosus. The mainstay of treatment for rosacea is oral antibiotics. These appear to work by reducing inflammation in the small blood vessels and structure of the skin, not by destroying bacteria that are present. Among the more widely used oral antibiotics is tetracycline. In many patients, antibiotics are effective against the papules and pustules that can appear on the face, but they appear less effective against the background redness, and they have no effect on telangiectasia. Patients frequently take a relatively high dose of antibiotics until their symptoms are controlled, and then they slowly reduce their daily dose to a level that just keeps their symptoms in check. Other oral antibiotics used include erythromycin and minocycline. Some patients are concerned about long-term use of oral antibiotics. For them, a topical agent applied directly to the face may be tried in addition to an oral antibiotic, or in its place. Topical antibiotics are also useful for controlling the papules and pustules of rosacea, but do not control the redness, flushing, and telangiectasias. The newest of these topical agents is metronidazole gel, which can be applied twice daily. Like the oral antibiotics, topical preparations appear to work by reducing inflammation, not by killing bacteria. Vitamin A derivatives, called retinoids, also appear useful in the treatment of rosacea. An oral retinoid, called isotretinoin, which is used in severe cases of acne also reduces the pustules and papules in severe cases of rosacea that do not respond to antibiotics. Isotretinoin must be taken with care, however, particularly in women of childbearing age. They must agree to a reliable form of contraception, because the drug is known to cause birth defects. Topical vitamin A derivatives that are used in the treatment of acne also may have a role in the treatment of rosacea. Accumulating evidence suggests that topical isotretinoin and topical azelaic acid can reduce the redness and pimples. Some patients who use these medications experience skin irritation that tends to resolve with time. For later stages of the disorder, a surgical procedure may be needed to improve the appearance of the skin. To remove the telangiectasias, a dermatologist may use an electrocautery device to apply a current to the blood vessel in order to destroy it. Special lasers, called tunable dye lasers, can also be adjusted to selectively destroy these tiny blood vessels. A variety of surgical techniques can be used to improve the shape and appearance of a bulbous nose in the later stages of the disease. Surgeons may use a scalpel or laser to remove excess tissue from the nose and restore a more natural appearance. Alternative treatments have not been extensively studied in rosacea. Some reports advocate gentle circular massage for several minutes daily to the nose, cheeks, and forehead. Scientifically controlled studies are lacking, however. Many people are able to avoid outbreaks by reducing things that trigger flushing. Alcoholic beverages, hot beverages, and spicy foods are among the more common factors in the diet that can provoke flushing. Reducing or eliminating these items in the diet can help limit rosacea outbreaks in many people. Exposure to heat, cold, and sunlight are also known triggers of flushing. The specific things that provoke flushing vary considerably from person to person, however. It usually takes some trial and error to figure these out. A deficiency in hydrochloric acid (HCl) in the stomach may be a cause of rosacea, and supplementation with HCl capsules may bring relief in some cases. The prognosis for controlling symptoms of rosacea and improving the appearance of the face is good. Many people require life-long treatment and achieve good results. There is no known cure for the disorder. Rosacea cannot be prevented, but once correctly diagnosed, outbreaks can be treated and repeated episodes can be limited. Avoiding anything that irritates the skin is a good preventive measure for people with rosacea. Mild soaps and cleansers are recommended. Astringents and alcohol should be avoided. Reducing factors in the diet and environment that cause flushing of the face is another good preventive strategy. Alcoholic and hot beverages, and spicy foods are among the more common triggers. Limiting exposure of the face to excesses of heat and cold can also help. A sunscreen with a skin protection factor (SPF) of 15 or greater used daily can limit the damage to the skin and small blood vessels caused by the sun, and reduce outbreaks. American Academy of Dermatology. 930 N. Meacham Road, P.O. Box 4014, Schaumburg, IL 60168-4014. (847) 330-0230. Fax: (847) 330-0050. http://www.aad.org. National Rosacea Society. 800 S. Northwest Highway, Suite 200, Barrington, IL 60010. (888) 662-5874. http://www.rosacea.org. Blackhead — A plug of fatty cells capped with a blackened mass. Erythema — A diffuse red and inflamed area of the skin. Papule — A small hard elevation of the skin. Pustule — A small pus-filled elevation of the skin. Retinoid — A synthetic vitamin A derivative used in the treatment of a variety of skin disorders. Rhinophyma — Long-term swelling and overgrowth in skin tissue of the nose that leaves it with a knobby bulb-like look. Telangiectasia — Small blood veins visible at the surface of the skin of the nose and cheeks. a disorder of the skin with eruption of papules or pustules; more particularly, acne vulgaris. acne congloba´ta (conglobate acne) severe acne, seen almost exclusively in males, with many comedones, marked by suppuration, cysts, sinuses, and scarring. cystic acne acne with the formation of cysts enclosing a mixture of keratin and sebum in varying proportions. acne ful´minans a rare form of severe cystic acne seen in teenage boys, characterized by highly inflammatory nodules and plaques that undergo suppurative degeneration leaving ulcerations, fever, weight loss, anemia, leukocytosis, elevated erythrocyte sedimentation rate, and polyarthritis. acne indura´ta a progression of papular acne, with deep-seated and destructive lesions that may produce severe scarring. acne necro´tica milia´ris a rare and chronic form of folliculitis of the scalp, occurring principally in adults, with formation of tiny superficial pustules that are destroyed by scratching. See also acne varioliformis. acne neonato´rum acne vulgaris in infants, usually in males before 3 months of age, chiefly characterized by papules, pustules, and open and closed comedones on the face; it is thought to be due to hormonal stimulation of sebaceous glands. The affected child may be predisposed to more severe acne in adolescence. acne papulo´sa acne vulgaris with the formation of papules. acne rosa´cea a form of acne in which the skin around each pustule is a rosy red; it is usually seen in persons over 25 years of age and is often psychogenic. tropical acne (acne tropica´lis) a severe type of acne vulgaris seen in the tropics when the weather is hot and humid, characterized by large painful cysts, nodules, and pustules that lead to the formation of rounded abscesses and frequent scarring and tend to localize on the back, nape of the neck, buttocks, thighs, and upper arms and usually sparing the face. It tends to affect those who have had acne vulgaris at an earlier age. acne variolifor´mis a rare condition with reddish-brown, papulopustular umbilicated lesions, usually on the brow and scalp; probably a deep variant of acne necrotica miliaris. acne venena´ta acne produced by contact with any of numerous chemicals, including those used in cosmetic and grooming agents and in industry. acne vulga´ris a chronic skin disorder usually seen in adolescents and young adults, in which there is increased production of sebum (oil) from the sebaceous glands and formation of comedones (blackheads and whiteheads) that plug the pores. Noninflammatory acne produces plugged follicles and a few pimples. Inflammatory acne is characterized by many pimples, pustules, nodules, and inflamed cysts. The lesions are found on the face, neck, chest, back, and shoulders. Treatment. The noninflammatory lesions often respond to over-the-counter creams and lotions, but inflammatory lesions may require intensive and individualized medical treatment under the direction of a dermatologist. Acne is treated by both topical and systemic drugs; the one most frequently recommended is benzoyl peroxide in a 5 or 10 per cent concentration. It is applied to the skin daily or as frequently as necessary to produce mild dryness of the skin. A mainstay for treatment of inflammatory acne continues to be oral tetracycline, which is effective for most cases and safe even when taken for years. A relatively new systemic drug for severe, treatment-resistant acne is isotretinoin (13-cis-retinoic acid). It inhibits the secretion of sebum and alters the lipid composition of the skin surface. Isotretinoin is a teratogen; hence it is not given to pregnant women. It can also cause bone changes. Minor side effects include dry mouth and dry eyes. Another agent used against acne is tretinoin (all-trans-retinoic acid), which is applied topically to reduce the number of comedones and to prevent formation of inflammatory lesions. Acne therapy can continue for months and even years. Patients who conscientiously follow the prescribed regimen greatly increase their chances for improvement and the prevention of permanent scarring and pitting of the skin. When acne has left permanent, disfiguring scars, there are medical techniques that can remove or improve the blemishes. One method is planing with a rotary, high-speed brush. This removes the outer layer of pitted skin, leaving the growing layer and the layers containing the glands and hair follicles. New epithelium grows from the layers underneath; it is rosy at first and gradually becomes normal in color. The technique has also been used successfully in removing some types of disfigurations resulting from accidents. This so-called “sand-paper surgery” or dermabrasion is recommended only for selected cases of acne and results are not always satisfying. Patient Care. Because patients with acne often have a lack of knowledge about the nature of their skin disorder, patient education is a major component of care. Additionally, the disorder often affects young people at a time when they are deeply concerned about their appearance and acceptance by their peers. Adolescents need to know that their concerns are taken seriously. Even though the disorder is not life-threatening, it can adversely affect one's self-image and self-esteem. Laypersons often are misinformed about the cause and effects of acne. It is not a contagious disease, nor is it due to uncleanliness or poor personal hygiene. It is not caused or made worse by lack of sleep, constipation, masturbation, venereal disease, or by anger or hostility. Dietary indiscretion can sometimes contribute to the appearance of lesions, but there are very few people who can find a cause-effect relationship between certain foods they have eaten and the appearance of acne lesions. In general, cola drinks, chocolate, and fried foods need not be restricted or eliminated from the diet in hopes that acne can be avoided or cured. A well-balanced diet is all that is recommended for the management of acne. Scrubbing the skin and using harsh soaps is not recommended because this only serves to damage the skin and predispose it to breakdown. A mild soap is as effective as special medicated soaps. If the hair is excessively oily, it may help to shampoo regularly and keep the hair off the face. Pimples and pustules should not be squeezed. This can press the sebum and accumulated debris more firmly into the clogged duct and increase the chance of inflammation and the spread of infection. Blackheads and whiteheads are best removed by applying a prescription medication that causes peeling of the skin. Since the management of acne can go on for years, requiring periodic evaluation by a dermatologist, patients and their families will need continued support and encouragement. Patients taking prescription medications will need to know the expected results, any adverse reactions that might occur, their symptoms, and to whom they should be reported. 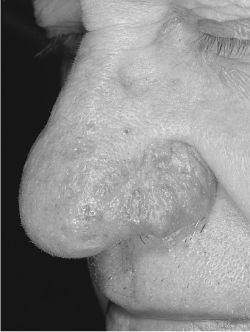 Chronic vascular and follicular dilation involving the nose and contiguous portions of the cheeks; may vary from mild but persistent erythema to extensive hyperplasia of the sebaceous glands, seen especially in men in the form of rhinophyma and of deep-seated papules and pustules; accompanied by telangiectasia at the affected erythematous sites. /ro·sa·cea/ (ro-za´she-ah) a chronic disease of the skin of the nose, forehead, and cheeks, marked by flushing, followed by red coloration due to dilatation of the capillaries, with the appearance of papules and acne-like pustules. A chronic dermatitis of the face, especially of the nose and cheeks, caused by dilation of capillaries and characterized by a red or rosy coloration and acnelike pimples. Also called acne rosacea. a chronic inflammatory disease seen in adults of all ages. It has two components: erythema and/or acneiform papules and pustules. It is associated with erythema, pustules, and telangiectasia, especially of the nose, forehead, and cheeks and ocular symptoms of conjunctivitis. See also rhinophyma. 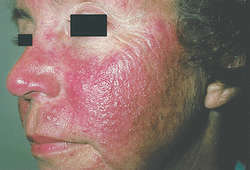 An idiopathic skin disorder affecting light-skinned, middle-aged men (more severely) and women (more commonly), characterised by chronic inflammation of cheeks, nose, chin, forehead and eyelids, and often accompanied by erythema or acne-like eruptions, prominent subcutaneous blood vessels, tissue oedema. Sun exposure, emotional stress, hot weather, heavy exercise, alcohol, cold weather, spicy foods, skin care products. Based on subtypes (erythematotelangiectatic, papulopustular, phymatous, ocular); includes avoiding triggers (sunlight, heat, alcohol, infections), tetracycline family antibiotics, lasers (single wavelength or broad spectrum) or CO2 to remove redundant tissue. Migraines, other skin disorders—acne vulgaris, seborrhoea, blepharitis, keratitis. Acne rosacea Dermatology An idiopathic skin disorder affecting light-skinned–of Celtic descent, middle-aged–♂ more severely, ♀ more commonly, characterized by chronic inflammation of cheeks, nose, chin, forehead, eyelids, often accompanied by erythema or acne-like eruptions, prominent subcutaneous blood vessels, tissue edema Associations Migraines, other skin disorders–acne vulgaris, seborrhea, blepharitis, keratitis. Cf Acne. Chronic vascular and follicular dilation involving the nose and contiguous portions of the cheeks with erythema, hyperplasia of sebaceous glands, deep-seated papules and pustules, and telangiectasia. Synonym(s): acne erythematosa, acne rosacea. Acne caused by systemic or topical use of corticosteroid drugs. A persistent skin disorder of unknown cause, affecting especially the area of the face around and above the nose and the below eyes (the ‘butterfly’ area). The main features are redness from small dilated blood vessels, acne-like PUSTULES and thickening and oiliness of the skin. The corneas may be affected and, in men, RHINOPHYMA may develop. Rosacea may be kept under control by a small daily dose of the antibiotic tetracycline. Tetracycline antibiotics or METRONIDAZOLE gel or cream may be applied to the skin. Rosacea is not an infection. n chronic disorder of the skin; marked by an increase in the size of subcutaneous blood vessels. The inflammation is most prevalent on the cheeks, eyelids, nose, chin, or forehead. Swelling, redness, an increasingly prominent appearance of blood vessels, noticeable increase in the tissue size, and skin eruptions resembling acne are common signs. Typically affects men and women with fair skin.